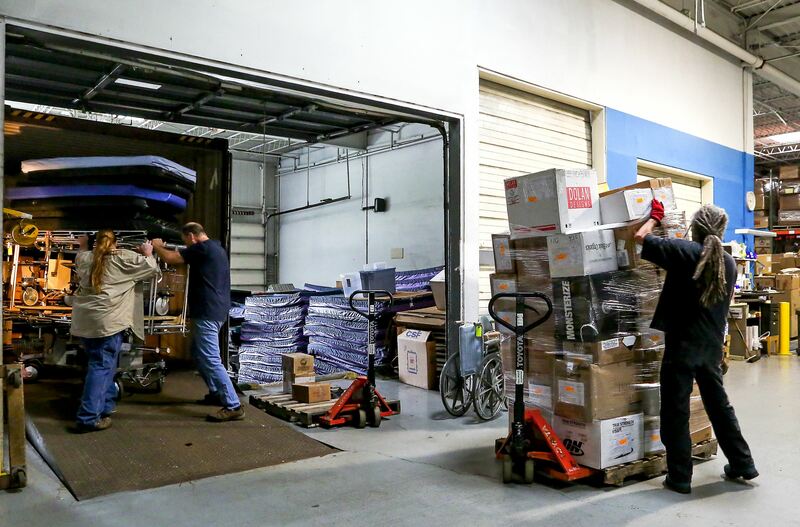 Global Links employees load their 124th shipment of medical supplies to Cuba onto a truck. This is the first step of transit to the island. Marisol Valentin still remembers the U.S. Customs officer who during one of her trips to Cuba told her she shouldn’t be working to send aid to the island country under a long-time U.S. embargo. On Thursday and Friday, Ms. Valentin, program officer for Pittsburgh-based nonprofit Global Links, oversaw the organization’s 124th and 125th shipments of surplus medical supplies to the island, sending gurneys, stretchers, and wheelchairs as well as 345 boxes of sutures, gauze and procedure-specific tools. It was $140,000 of materials that might otherwise populate landfills. “If it can improve one patient’s care, why should it be discarded here?” asks Angela Garcia, deputy director. Throughout the last two decades of the embargo, Global Links has established a conduit of supplies reclaimed from hospitals in Pittsburgh, Maryland and Virginia. Formed in 1989, Global Links was the first nonprofit to receive an export license from the U.S. Commerce Department to provide large-scale humanitarian medical aid to the state-owned hospitals in Cuba. Due to the embargo, the hospitals cannot import American-made medical technology or products that have a certain percentage of American parts, either from abroad or directly from the United States. He hand-carried them back, sending photos over the following years of cases in which the material aided successful surgeries. After Hurricane Sandy in 2012, it was donations from Global Links that helped hospitals in Santiago de Cuba prepare for the possibility of cholera. Though the embargo’s future is unclear, the impending normalization of relations between the United States and Cuba has already made Ms. Valentin’s work easier, eliminating her need for a special U.S. Treasury Department license to travel. She hopes that in the future the easing of barriers between the two countries will extend to medical knowledge. In 2009, a Cuban transplant team came to Pittsburgh to observe procedures at UPMC Children’s Hospital, and doctors observed streamlined emergency room procedures, which reduce wait times, at St. Clair Hospital. This streamlining is a result of Toyota principles, which focus on continual improvement in efficacy. Knowledge can go both ways. “We have a lot to learn from them,” said Mimi Falbo, who served as president and chief executive officer of UPMC Braddock and teaches at Carnegie Mellon University. She cited indicators of good public health outcomes in Cuba, including low infant mortality rates (4.7/1000 live births, as of 2014), which she attributes to a focus on prevention. Elizabeth Miles: emiles@post-gazette.com or 412-263-1724. Insurance titan Maurice “Hank” Greenberg is the latest U.S. businessman looking to possibly expand in Cuba now that the Obama Administration has reversed more than 50 years of policy and has taken the first steps toward normalizing relations with the government there, the FOX Business Network has learned. Greenberg, the chief executive of Starr International, traveled to Havana’s Jose Marti Airport last Thursday aboard his private jet, returning the next day following meetings with senior level Cuban government officials, according to people with direct knowledge of the matter, and according to flight records obtained by FOX Business. In a telephone interview, Greenberg confirmed the trip and his meetings. The former long-time CEO of American International Group (AIG) and now CEO of Starr International has been a pioneer in expanding insurance operations across the globe. AIG, for instance, has a large presence in China thanks to Greenberg’s work with government officials, beginning in the mid 1970s. Greenberg said that Starr is looking at possible insurance opportunities as American tourism companies expand in Cuba, though he added that he doesn’t see any short-term business dealings given the nature of the normalization process, which will likely be phased in over a number of years. “I think there’s going to be more tourism, so there might be a business opportunity for us,” said Greenberg who declined to name the government officials he met with during his one-day trip. Starr already owns a business known as Assist-Card, which offers insurance to people who want to travel to Cuba. But Greenberg confirmed that his trip involved broader discussions about possibly expanding other areas of Starr’s insurance business such as providing insurance for hotels. Since President Obama announced that he was taking the first steps toward ending a 55-year economic blockade of the Cuba that began after the 1959 Cuban revolution, American businesses have been eyeing the business possibilities there. American tourism-related business has a particularly keen interest in expanding in the island nation, though many are finding it easier said than done. For starters, the trade embargo still exists, and companies will have to deal with layers of laws and regulations from the U.S. and the Cuban governments to do business. For instance, Hilton Worldwide Holdings (HLT) has been observing the changes in U.S.-Cuban economic policy since the president announced his intentions to normalize relations in December of last year. But the hotel company has yet to formally engage the Cuban government to expand its presence, and the closest it has come to doing so will be when Hilton officials take part in a cultural mission with other business leaders and travel to Cuban toward the end of the year, a person with knowledge of the matter says. “The embargo still exists so there’s not much Hilton can do,” said one person with knowledge of the matter. A Hilton spokesman had no comment. Despite these obstacles, many businesses are looking at Cuba as the next big growth opportunity. Beginning on July 3, Jet Blue (JBLU) will fly from JFK Airport in New York to Havana. Car rental company Avis (CAR) has joined JetBlue as part of a program to rent cars including those on the island, according to people with knowledge of the matter. Avis spokeswoman Alice Pereira didn’t return telephone calls for comment. A spokesman for JetBlue had no immediate comment. Greenberg, who just turned 90, and started in the insurance business just around the time the US. trade embargo went into effect in 1960, says he doesn’t see opening a Starr office in Cuba anytime soon. “Nothing over there will happen immediately,” he said. MARIA LA GORDA, Cuba (AP) — The coral reefs and gin-clear waters off the coast of Cuba offer some of the best diving in the Caribbean and some of the best-preserved reefs on earth. And if travel restrictions on U.S. tourism to Cuba are ever lifted, the remote Peninsula of Guanahacabibes could well become a popular destination for American divers. The land and marine reserve encompasses some 200 square miles (518 square kilometers) on Cuba’s westernmost tip about 135 miles (217 kilometers) northwest of Havana. It juts into the Caribbean, with protected forests on land, aquamarine waters lapping at white sand beaches and pristine coral beds teeming with a colorful variety of fish just offshore. In some ways, the peninsula is just as frozen in time as other aspects of life in Cuba, where 50-year-old cars are common and Wi-Fi is scarce. But the lack of change here has had a positive effect, sparing Cuba’s reefs from the degradation evident in coral beds elsewhere. Lack of agricultural run-off, little coastal development and strong environmental laws have all helped keep Cuba’s reefs healthy. That said, several factors stand in the way of Guanahacabibes becoming a major tourist attraction any time soon. For one thing, while President Barack Obama has relaxed limits on travel to Cuba, trips from the U.S. to Cuba for pure tourism remain prohibited by U.S. law. The Obama administration has said that it believes more U.S. visits to Cuba will accelerate reform on the island. But Obama’s critics say that U.S. visits simply feed cash into coffers of government agencies like the military-run tour company that oversees diving in Maria La Gorda, the resort inside the Guanahacabibes reserve. Despite the travel ban, however, thousands of Americans are visiting Cuba, some flying in via third countries like Mexico or the Bahamas, others certifying that their trips meet standards for permitted categories such as educational or cultural travel. Another impediment to tourism here is Guanahacabibes’ location. It’s a five-hour drive from Havana over tortuous roads to get to Maria La Gorda. Finally, even though international travelers and moneyed Cubans enjoy the area, eagerly taking in the sights underwater, it doesn’t offer the type of comforts Americans are accustomed to. The dive resort has the feel of a summer camp: spare hotel rooms (though they do have air conditioning) and a buffet that serves unimaginative fare of rice, beans and either chicken, beef or the ubiquitous pork Cuba is famous for. And since it’s located at the edge of a protected reserve, there are no other visitor options for miles around. Despite the lack of luxury, the attractions of the sea satisfy even the most demanding divers: clear water, spectacular coral heads towering 60 feet (18 meters) and an abundance of marine life. Manuel Mons, 55, a marketing manager for a Cuban state-run tour agency, says Cuba is uniquely suited to ecotourism because of its lack of development and strong environmental laws. A recent attempt by members of the House of Representatives to block new cruises and flights to Cuba won’t likely get far, according to a recent statement from the White House. Republican congressmen have attached new Cuba restrictions to a major transportation bill (H.R. 2577), but a statement from the White House indicates that President Obama will wield his veto pen if the bill contains such limitations on travel to Cuba and other inclusions the White House deems objectionable. Republican Florida Rep. Mario Diaz-Balart introduced legislation to block new flights or cruise departures to Cuba saying that the travel violates the Cuban travel ban, which is based on the broader U.S. embargo of Cuba in place since the early 1960s. The embargo cannot be removed without an act of Congress. But Obama has begun relaxing relations with Cuba through executive powers he can exercise without congressional action. Limitations on travel to Cuba were not the only reasons stated for White House opposition to the transportation bill. ASTA, The American Society of Travel Agents, has joined a newly formed group that supports normalizing trade and reforming travel policies with Cuba. ASTA joined the Engage Cuba Coalition “in an effort to generate support from American businesses and non-profit groups to reform U.S. travel and trade restrictions with Cuba,” according to a statement. Zane Kerby, ASTA’s president and CEO, focused on the economic benefits of opening trade and travel to Cuba. In pursuit of said economic benefits, the new group is bringing considerable economic and political clout to bear. The membership includes the National Foreign Trade Council, National Association of Manufacturers, the Consumer Electronics Association, the Council of the Americas, Engage Cuba—Third Way, #CubaNow, Cuba Study Group and the Center for Democracy in the Americas. Major corporate entities such as Procter & Gamble, Cargill, Choice Hotels and The Havana Group are also giving their support to the effort. ASTA has estimated that at least 2 million additional Americans could visit Cuba by 2017 if Congress votes to lift travel restrictions by end of year. But as great as the economic rewards may be for a repeal of the travel and trade ban, advocates are shooting for something even higher in their efforts at persuasion: the freedom to travel. A newly-formed bipartisan group is launching an ad today on national cable calling for open relations with Cuba. "It’s been over 50 years," a narrator says. "Isn’t it time for a change?" The ad will air on Fox News, CNBC and MSNBC and is paid for by the business-backed Engage Cuba. The advocacy group is run by top Democratic and Republican strategists and is supported by a number of lawmakers, including Florida Rep. Kathy Castor, D-Tampa, who is attending a launch party in Washington this evening. The 30-second ad notes that Americans can travel to North Korea but not Cuba. "It's actually against the law," the ad states. (Some Americans, however, can travel to Cuba, including people with relatives there, artists, students and journalists). The group cites a study asserting trade with Cuba would generate $5.9 billion in annual U.S. exports. While the Obama administration has moved to restore ties with Cuba, the trade embargo would require congressional action and Republicans, led by Florida members, oppose any effort. The ad is designed to chip away at that opposition and build on growing public support for restored relations. The group is lobbying on Capitol Hill for the Freedom to Travel to Cuba bill, which has 40 co-sponsors in the Senate. “One of these days, our legislative branch of government is going to have to start to function,” concluded Luke Albee, a Senior Advisor to Engage Cuba who served prominent Democratic Senators in Congress for more than 25 years. “There is no better issue to help make this happen than changing our archaic Cuba policy. It is in our national interest. And it is right for America." Engage Cuba is a bipartisan 501(c)(4) public policy organization dedicated to coalescing and mobilizing American businesses, non-profit groups and concerned citizens for the purpose of supporting the ongoing U.S.‐Cuba normalization process and enacting legislation to reform U.S. travel and trade restrictions with Cuba. Engage Cuba is working with leading Republican lobby firm, Fierce Government Relations, to coordinate its legislative strategy in Congress. Engage Cuba’s membership includes organizations and businesses across sectors, with major trade groups like the National Foreign Trade Council, National Association of Manufacturers, the Consumer Electronics Association, Council of the Americas, and the American Society of Travel Agents. Engage Cuba’s members also include civil society organizations such as Third Way, #CubaNow, Cuba Study Group and the Center for Democracy in the Americas. In addition, Engage Cuba is already working directly with leading companies who share its goals of lifting the travel and trade bans with Cuba, including Procter & Gamble, Cargill, Caterpillar, Choice Hotels, The Havana Group, among others. Congress continues to be on the wrong side of Cuba policy. The Republican-led House has attached language to a series of appropriations bills that seeks to reverse the progress President Barack Obama and the Cuban government are making to bring the nations closer. These back-door efforts to frustrate diplomacy would ultimately hurt families, stable relations and business in both countries. And they show how far out of synch some in Congress are with reality and public opinion. The congressional moves are retaliation for Obama's new course on Cuba. In December, the president announced the United States would expand legal travel to the island, increase the amount of money that could be sent back to Cuban nationals and allow new commercial exports to the island. The president has also moved to re-establish diplomatic ties with Cuba, beginning with removing Cuba from the U.S. list of states that sponsor terrorism. That clears the way for reopening the U.S. Embassy in Havana. Only Congress can end the 54-year-old trade embargo. But members are now undercutting the president's executive actions, too, by placing riders on must-pass spending bills for next year. One rider to the bill funding the departments of Commerce and Justice would prohibit doing business with anyone in Cuba who has family in the Cuban military — an overly broad and almost unverifiable prohibition that's meant to chill trade across the board. A rider to the transportation bill seeks to bar the expansion of travel options to Cuba, from new air flights to ferry service. And the House has proposed legislation that blocks funding for a new U.S. Embassy. These are the tired salvos from members of Congress who would continue five failed decades of isolation. The world has moved on and so has public sentiment, including among South Florida's Cuban-American community. Gallup polls show that support for Cuba has increased steadily in the United States over nearly 20 years. A MSNBC/Telemundo poll in April found that 59 percent of Americans, including 56 percent of Latinos, approve restoring diplomatic relations with Cuba. That tracked a poll in March by Bendixen & Amandi, a Miami-based media and public relations firm, that found a majority of Cuban-Americans said they were in favor of normalizing relations. Last year, the Cuba Poll at Florida International University, which is the longest-running research project to track Cuban-American opinion in South Florida, found that two-thirds of those polled favored diplomatic ties, while a majority opposed the embargo. Times change. The Cold War is over. China is toying with joining a massive, U.S.-led Pacific trade deal. America is Vietnam's top export market. The United States and Iran are negotiating to put Tehran's nuclear ambitions under wraps. These monumental changes all started with the understanding that national interests evolve. Americans get that with Cuba. Now it's time for Congress to demonstrate the same pragmatism and replace a Cuba policy based on denial and harassment with a more constructive dialogue that acknowledges changing economic and social realities. Beyond the headlines of new diplomatic relations between the U.S. and Cuba, Auburn University is put that diplomacy into action. 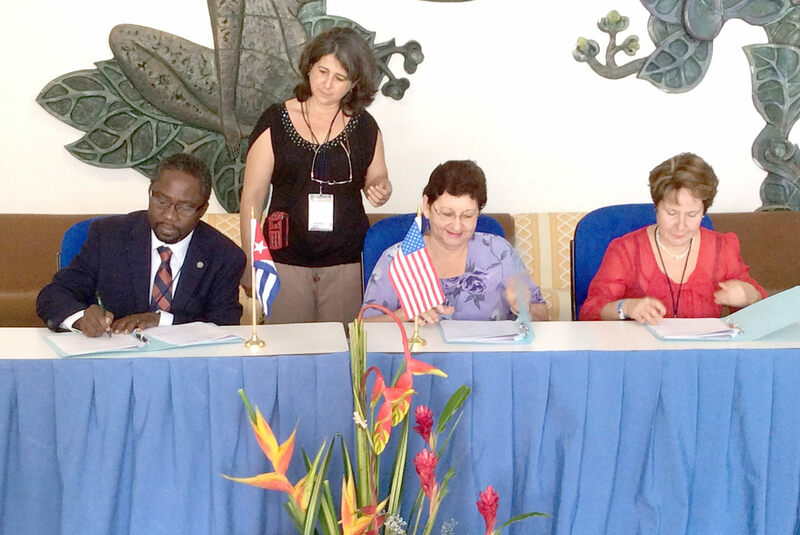 The school has signed an academic exchange pact with Agrarian University of Havana and the Cuban National Center for Animal and Plant Health. Auburn faculty and agricultural students will be able to study on the island nation 90 miles south of Key West – saving the expense of traveling to Africa or Asia -- while Cuban faculty and students can study at Auburn. The schools will have a pathway to exchange agricultural techniques and ideas. It could lead to strong economic relationships between Cuba and the state of Alabama, Fadamiro said. Auburn is the first U.S. university to establish an agricultural-based relationship with a university in Cuba. "It's a mutual benefit," he said. "It's really special not only to us but to Cuba." Auburn officials have been invited to return to Cuba in September for a "brainstorming" session on how to get the most out of the new relationship, Fadamiro said. One aspect Fadamiro said Auburn students and faculty are eager to learn about is how Cuba's agricultural system helped sustain the nation despite a lack of mechanical aid. "We have a lot to learn from Cuba – the way they have been able to sustain their agriculture without mechanization," Fadamiro said. "In the U.S., we do a lot of mechanization but in Cuba, they don't do that. But they have been able to sustain parts of their agriculture, so we have some things to learn from them." That's critical, he said, as the world seeks to increase its food production to match projected increases in population. "One of the things we are focused on is global food security," Fadamiro said. "How do we secure global food security? The world population is about 7 billion and it's projected to rise to about 9 billion by 2050. That means we have to increase food production by over 70 percent in order to be able to feed the people around the world. "So we have to increase agricultural productivity. That is a big challenge, a grand challenge that no one single country or one single nation can address. So it requires partnerships with various institutions all around the world." Meanwhile, Fadamiro said that roughly half of the poultry consumed in Cuba comes from Alabama. "In terms of economic development, the state of Alabama has a lot to gain by walking with Cuba, entering into trade agreements with Cuba," he said. "This type of academic extension agreement can serve as a platform to build upon."